Red Truck Painting provides residential and commercial painting for Victor, NY and surrounding areas. I grew up in Victor, on East St. We have painted my mother's red house about five times now! 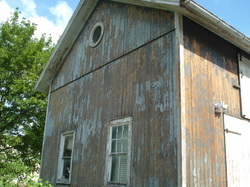 One of our most memorable jobs in Victor had us working on an old house and barn on Coville St. When I was a child I spent a lot of time at this barn - and it hadn't been painted since then. This job had us doing a LOT of scraping and sanding! Talk about peeling paint. It looked great when we finished, and was a very rewarding project.